Karbonn Mobiles, the Indian joint venture between Jaina & United Telelinks the makers of Mobile phones today announced the launch 10 new GSM Mobile Phones that too featured packed and at an affordable cost. The company has also announced its planning to launch Android powdered 3G smartphone in Indian market at affordable price soon. Karbonn Mobile’s new GSM handset range comes in a variety of Touch Screen, QWERTY, Dual GSM, Multimedia and Music phones across various affordable price points. The models launched are K1414, K25i, K550i, K424, K343 K316, K111, K11, K514 and K451i and the price range is between Rs.1500 to Rs. 5000. 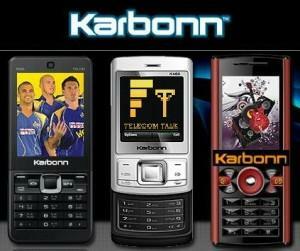 Karbonn K550i, K424, K343 and K316 are music phones, while the K111, K11 and K514 multimedia rich handsets design for highland users. In addition, the K451i comes with superior long lasting battery backup for Voice and SMS usage. The K1414 is touchscreen handset which has been sculpted to sport an appealing look while the Wi-Fi enabled K25i comes handy for social networking freaks. It also equipped with a QWERTY keypad to provide easy and smooth messaging experience for its users. Hey ! its not true. me too using samsung wave723 and its working fine. Previously, I was using Nokia N71 along with same operator, sometimes signals fluctuated but now its fine. Hardly I see any signal fluctuation. I heard tat samsung wave & Galaxy phones are having poor signal reception is it true? ?